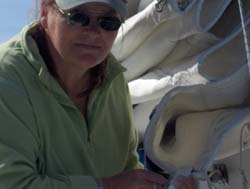 The last few months - April to June 2005 saw new and rebuild equipment purchased and commissioned. Spending money like drunken sailors we were. Here are some of the projects. You can click the pic's to zoom if you like. The trampolines are just nylon lines coated with UV acrylic paint. When the paint fades, UV and salt attack the nylon. Sharon's fresh coat of paint gives extra life and a nice look. Leaks killed the previous auto pilot drive. 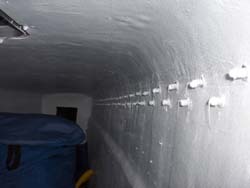 The problem is air has to get in, but water has to be kept out. I built a teak border and and lined it with weather stripping. Then added a low dorad arrangement to stop water but allow air. Hope it works! 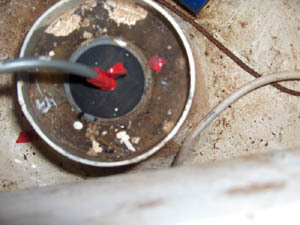 Note water jug compressing glued components. I had to exhale hard to get my chest cavity squeezed in here. Dennis Pickard squeezed in here the first time. He and I waterproofed all the fittings but we missed one. Now they are all done. 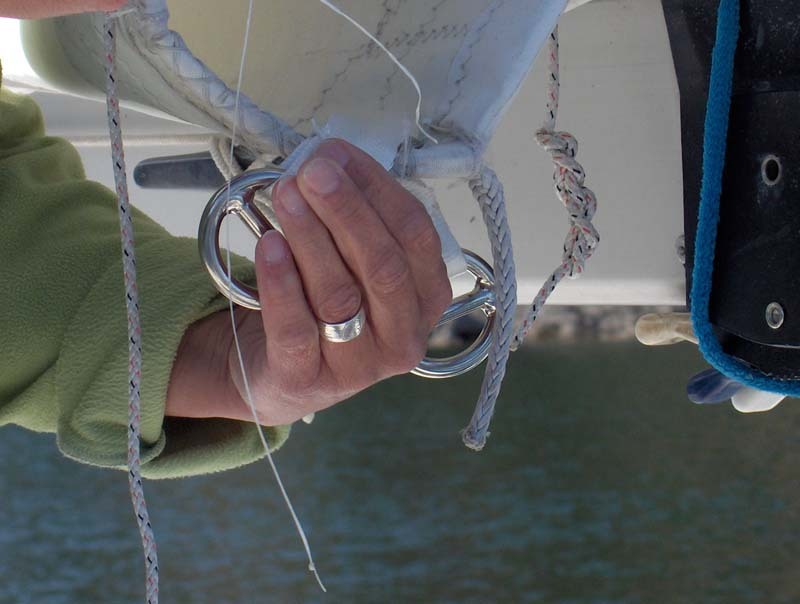 These are some nifty cringles that make reefing the sails a lot easier. On the ocean, sailing with two people, you reef a lot. Sharon sewed these on in a jiffy. This is the little do ma higgie. 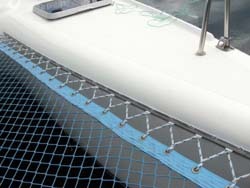 It is just a two circles joined with some webbing that passes through the regular reefing cringle. Because it is flexible, it is a piece of cake to slip on. Some of the rivets on the port side had corroded and the tramp was not fully supported. Sharon and I drilled, caulked and re-riveted the whole thing. And the view from inside the cabin. This cabin is called the "Ditch". Partially because the first waterway we sailed was called the ditch. The name is appropriate as this cabin gets little attention and sometimes looks like a ditch. 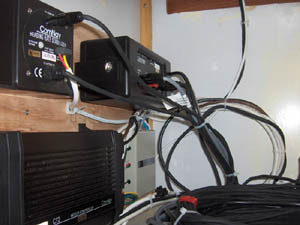 Lots of fun getting all the wires connected to the right places and configuring the software. But voila - Radar. A lot of people insist is a necessity. I'm gonna need a good thick fog to be convinced! To the right a sample of the radar display. 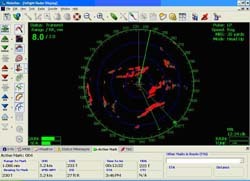 Here is a sample of the radar display overlaid on the electronic chart. This is a heads up display while approaching Steward Island. Note slight differences in radar echo vs the chart. Which is right? Radar should be more accurate. Here is the radar dome. Rick Sarber helps install the rebuilt Profurl sail furler and new forestay. 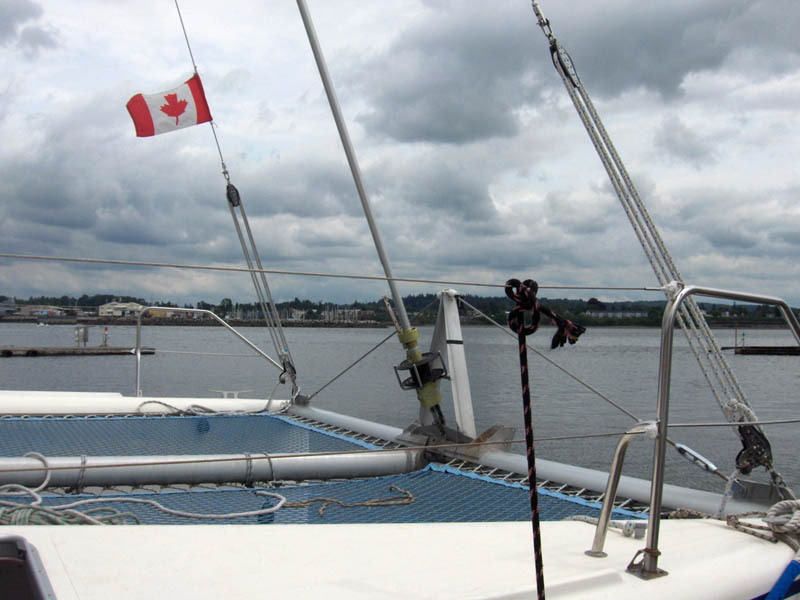 Protech from North Vancouver rebuilt the furler and supplied the new forestay. 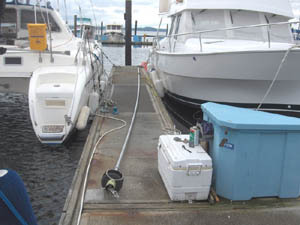 The running back stays became running front stays to support the mast while the forestay and furler were changed out. Most of the time those running backs just get in the way. But once in a while they are real handy! 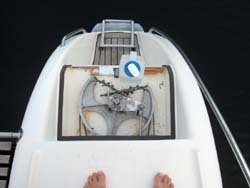 A good under deck auto pilot like this will make sailing with two much easier. 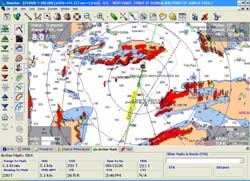 I can tell the pilot either a direction or a course to sail. 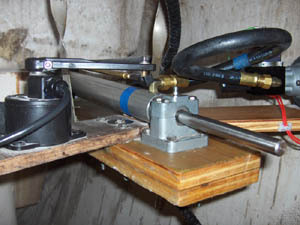 The hydraulic ram pushes on a small tiller mounted on the port quadrant. 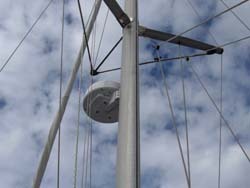 The drive is mounted in the port stern floatation compartment. Note the beefed up mount. Getting the components all wired up to work in harmony was a bit of a challenge. It was great to try it out and see all the components working properly. 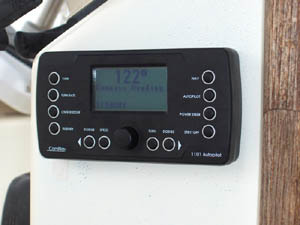 A good depth sounder is essential for navigating. When Sally's sounder started failing intermittently it was tough to isolate the problem. 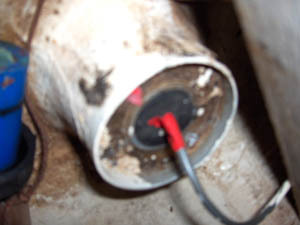 The picture right shows the problem component. 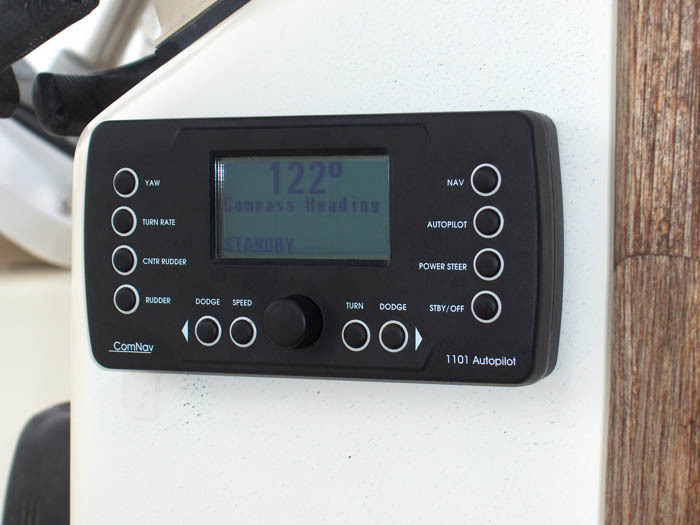 It is the original depth sounder that the manufacturer glassed right to the hull of the boat! 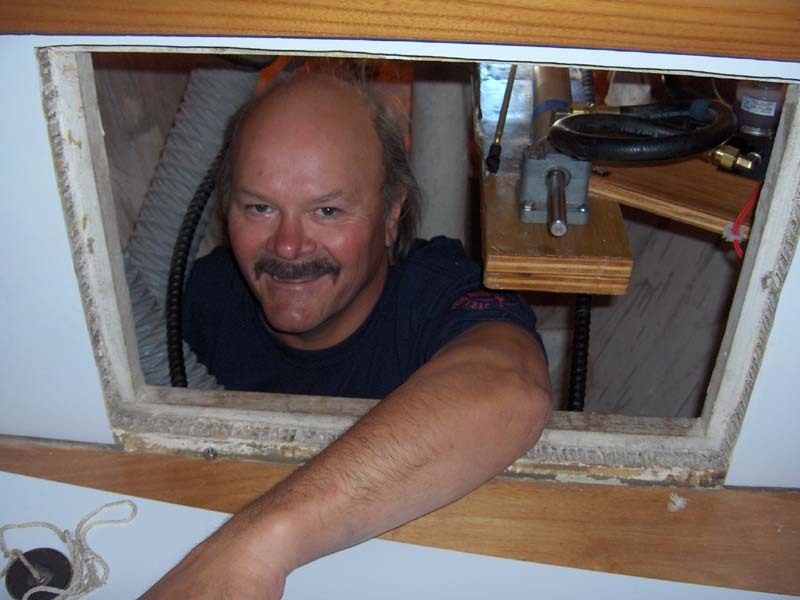 I had to grind this sucker down to hull level and clear fiber glass, then install a new sending unit. Where is it? Why under the toilet of course. Two ugly hours with a grinding disk and heavy duty dust mask, and I was ready to install the new one. We have owned Mustang Sally since 1998 years and it is fair to say she has been completly refit. 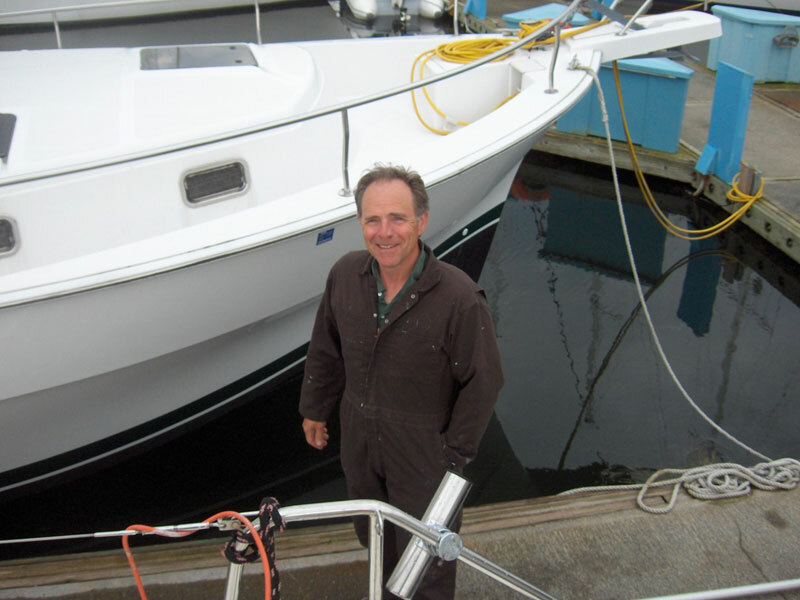 Both engines rebuilt, cabins and heads rebuilt, sail drives rebuilt, galley rebuilt, new sails, new standing and running rigging, rebuilt hatches, the list goes on and on. 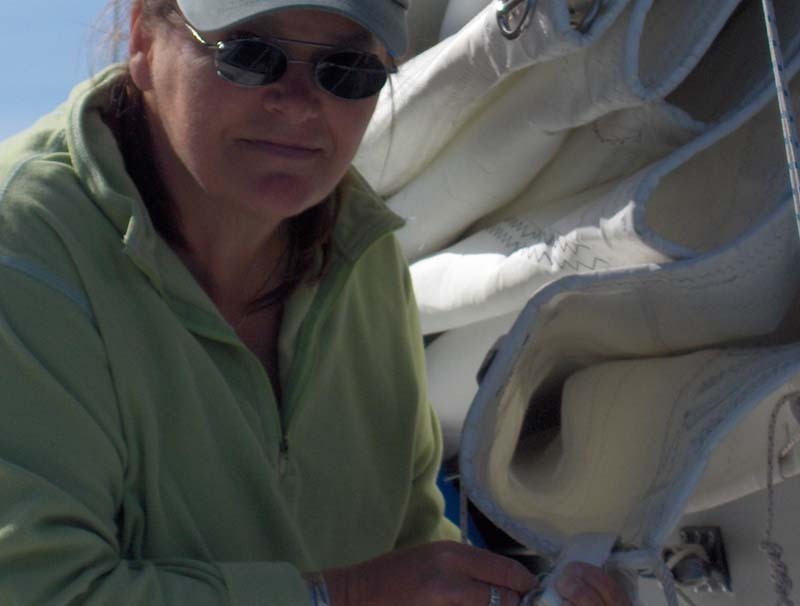 We have been getting Sally ready to cruise the world for five years. 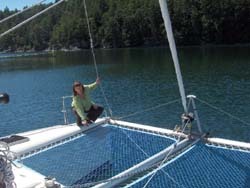 She is ready for the oceans of the world.